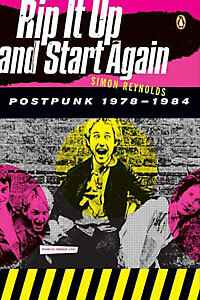 I’m very excited about the release of Simon Reynolds’ book Rip It Up and Start Again: Postpunk 1978-1984. This is exactly the period I’ve considered writing about before, though only about the local Toronto scene. This was not only an incredibly fertile period for music in general, but it corresponded with the exact years I was most receptive to it (13-19). There’s a good review in the NYT today (free registration required). Check it out. And if you’re coming to SXSW, make sure you get one of my annual Compilation Champs CDs. I guarantee several tracks of postpunk goodness! Bonus points to anyone who can tell me where the title of the book comes from. UPDATE: I just found Simon Reynolds’ blog! Via the excellent Silence Is A Rhythm Too, which has been featuring MP3 downloads of various postpunk classics. Reynolds also has an author site with more info on the book, and recently hosted a panel discussion which included Steven Daly of Orange Juice and No Wave pioneer James Chance (of James Chance and the Contortions). It’s a big download but looks to be worthwhile. It’s not the Buzzcocks, is it? I’ve added it to my wishlist. I haven’t read his Generation Ecstasy, but have always enjoyed his stuff in The Wire. Should be a good read for us music nerds. Thank you for the link and kind words. What a great book, eh?